This month’s “Carnival of Journalism” is to write a note to yourself in the past. So – it’s 2004. I am 21 and about to graduate college. Here’s what I’d tell myself about the path of my career. The good, the ugly and hopefully some advice. The Road Less Taken: In 2005 you leave for NY. Wired lets you hire your replacement (those fools!) so of course you hire your roommates boyfriend (who you had become friends with). Fast forward to 2014 next month. He is still working there. His job title has changed …. but he took your job and has ridden it for almost 10 years. He has a wife and a kid and is able to provide. So here’s your Braveheart Moment…. 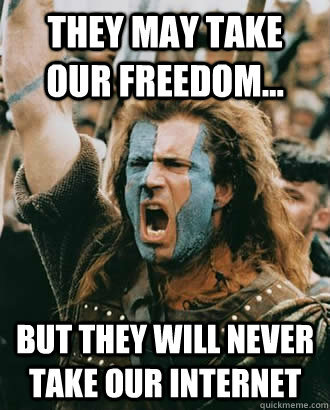 William Wallace: ….. many years from now, would you be willing to trade all the days, from this day to that, for one chance, just one chance, to come back here and tell our enemies that they may take our lives, but they’ll never take… OUR FREEDOM! You took that chance. You left the comfy job that could have lasted a decade and went out into the world. You’ve taken an unconventional career path. A career more akin to “gigging” rather than working for a company for 10 years. You are in the middle of the ride as you write this note to yourself. It’s hard to know if it will all work out. There is an element of jumping out of a plane and weaving the parachute on the way down. This is accentuated as you get older and start to have concerns about mortgages, family, etc. But the view is pretty thrilling. Let’s start off with the good news. There is little to regret. Everything works out. Yes, you hate your internship now at the Nob Hill Gazette. You will live out of your car for a month in SF (nothing dramatic, just can’t find a place to live) and a closet in NY for a year – but you have a blast. The thing that set you up was an intellectual curiosity. You studied and pondered the flow of information. That lead to a career in journalism (a profession that deals with the flow of information). And then your first big break: You started out as a technology reporter. I can’t underscore that enough as your first saving grace. Starting out at Wired was the perfect place to get your feet wet. As a technology reporter you became fascinated with how the flow of information itself is evolving and you began to realize that the trends you report on in other fields can also be applied to journalism. Some highlights along the way that touched on this theme. You were one of the first journalists to openly recognize and participate in “Digg.” You were a “top 50 digger” which is embarrassing to say now, but was cool at the time. Digg and its community laid the bedrock for the rise of Web 2.0 and certainly a new way to think about the news. You had a front row seat and participated if only in a small way. You were part of the first major experiment in crowdsourced journalism. Hell – you helped write the book on “crowdsourcing” (research assistant!). During that time you helped create a blog that made it into the Technorati 200. You were the founder of the first major experiment in crowdfunded journalism. It was during this time you began to crystalize your role in the journalism community. Your career was about experimenting with the process of journalism – making it more transparent and participatory. You’ve had the chance to work at (or study) at 5 Universities in real concrete ways and organize half a dozen conferences – all around the concepts you love, participatory journalism or how media companies must evolve to to become technology companies. Which is to say – you’ve had a kind of consistent theme (or thesis) behind your work. You are part of the first major effort to reform storytelling so it is structured not around “articles” but a different phenomenology of news. This same effort pioneered what a mobile news organization could look/feel like. It sounds all like a magic carpet ride from 2004. A whole new world! A letter to yourself 10 years ago wouldn’t be of any value if it didn’t provide some harsh views as well. Then we can take the good, the bad and maybe have some real advice. You will feel like a bit of an outsider. Despite the resume-like list above, what you do is on the outskirts of the journalism industry. You receive critical praise for your work within the digital journalism community, but outside of it – you’re mostly gawked at. Your goal is to effect change in the larger industry. You’ve made small pushes, but if we are honest with ourselves, we are left feeling like it hasn’t happened…. yet. That can leave a bitter taste in your mouth, but it’s important not to get bitter. Know the difference between arrogance and confidence. Know the difference between being different and being disliked. Work is the #1 thing you’ll do in your life. It’s where you’ll spend more time than any other hobby – so make sure it’s something you are interested in. Be prepared: There is an east coast bias in the journalism industry. Like it or not you are a Californian. The call to come home meant accentuating your “otherness” (see above graphs) from most major media companies and some missed opportunities. San Francisco is much more livable though. Friends, family, the whole deal – it’s worth the trade. Quick discussion on east coast bias here. Remember to keep your head down rather than worry that “everyone else is busy doing better than me.” It’s a natural feeling, but it’s as much a lie as Facebook is (all those happy posts). Don’t fall into the trap of worrying about Twitter/Instagram/RebelMouse/YadaYada followers. There is an opportunity here in terms of career – and you know folks that make their claim on it, but it’s not for you. You are a starter, not a star. Maybe this hurts your career, but you are not interested in flurry-filled info-posting. You want to be more than a (well-greased) cog in the info-wheel. You want to design. You want your designs to be critiques. Learn to pace yourself: For a period of time you believed that because the Internet didn’t sleep, you couldn’t either. This is patently not true and not sustainable. Work hard when you can, but learn to not feel guilty when you step away. There were definitely a few years where you were burning your candle on both ends. You are more valuable working at a sustainable level then being a flash in the pan on any one project. Find Great Mentors. Be one when you can: The space you work in is also relatively small. Be kind. It comes back in waves. You have no reason to be anything but giving, because along the way you find great mentors yourself. They are too important/many to try and list here. But always keep your eye out for who you can learn from. Don’t be afraid of failure: As long as you are working in the journalism experiments – you can’t be afraid of failure. Fear leads to anger. Anger leads to hate. Hate leads to suffering. If you wanted a steady job where you knew the patterns of success – you could have stayed at the job in 2005.